China’s Belt and Road Initiative is arguably the biggest regional connectivity and cooperation programme in operation today. But with China being a major polluter, there are also concerns the Initiative could just be adding to global environmental stress. Not so, argue John A Mathews and Carol X Huang of Macquarie University, Sydney: it’s actually a magnet for renewable energy investments. Courtesy of The Asia-Pacific Journal. Are China’s energy investments around the world promoting green and clean power generation in countries other than China, or are they exporting China’s dirty coal-fired power generation capacity to third countries? This is an important question, and much hangs on how it is answered. China’s Belt and Road is a conduit for polluting investments by Chinese policy banks around the world, argues Kelly Sims Gallagher (The Fletcher School, Tufts University) in a Beyondbrics comment in the Financial Times on 10 August 2018. But when examined, this argument is not persuasive. 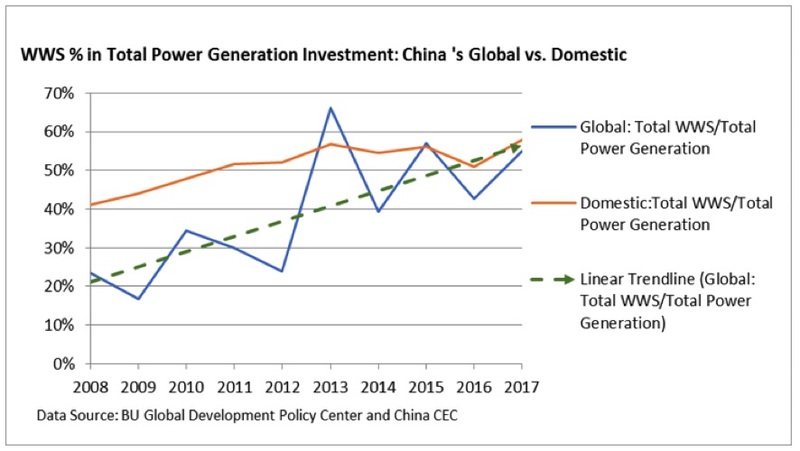 If we use the same China Global Energy Finance (CGEF) database that Gallagher uses, it is easy to demonstrate the opposite finding, namely that China’s investments globally in power generation over the past five years have been more green than black. In this commentary we use the CGEF data (housed at Boston University, or BU) to demonstrate that over the past five years, more than 50% of China’s investments in power generation projects around the world have been directed towards those sourced from water, wind and sun. Moreover, we demonstrate that China’s investments in clean and green energy projects around the world have increased as a proportion of total power generation investments from 20% to 55% – or a 35% increase in a decade, with the most recent results indicating that green investments globally outrank investments in black thermal power projects. The CGEF seeks to capture investments channelled via the China Development Bank (CDB) and the Export-Import Bank of China (China Eximbank) and we utilise the same data source to demonstrate the greening trends in China’s global energy investments. The wider significance of this is that while China is now widely recognised as being a global leader in swinging towards a greening of its domestic power system, there is great suspicion that China is not translating this green drive across to its global investment activities. The CDB and China Eximbank combined have become by far the world’s largest sources of energy finance around the world (now channelled through the Belt and Road initiative or BRI), and so what they do with their lending policies matters a great deal. That is why it is important to accurately characterise the real green shift that is under way in their global energy portfolios. According to the CGEF database, China invested $25.6bn in energy projects around the world in 2017 (encompassing investments in power generation, oil and coal extraction, and use of fuels in industry, agriculture and transport). Investments in electric power generation amounted to $14.6bn, of which clean sources encompassing water, wind and sun (WWS) amounted to just over $8bn, or 55% of the total global investment in electric power generation. This result in 2017, where clean energy investments by China around the world exceeded sums invested in fossil fuel power generation projects, is by no means anomalous. Referring to the BU database (CGEF) we find that for the five years from 2013 to 2017, global investments by CDB and China Eximbank in energy projects amounted to $140.7bn, with $62.7bn being investment in power generation projects. Of this, no less than $33.1bn was invested in clean WWS projects, ie more than 50% was directed to clean energy investment over the five years. A further $9.7bn was invested in nuclear power projects, leaving just on $20bn for investment in thermal power generation projects around the world over the five years. Of course, the BU database on global energy investments by China is not perfect. It has many notable gaps, such as no entries for Chinese wind power investments globally in the years 2017, 2016, 2014 and 2012; entries for nuclear power investments only for the years 2014 and 2015, neglecting investments made in other years; and neglecting investments in solar projects in 2014 and 2011. No doubt the BU faculty at the GDPC is working hard to remedy these deficiencies, not least through expanding consultation with the two banks involved. But for our critique of the statements from professor Kelly Sims Gallagher, these anomalies do not matter; we are confining ourselves to the same database that she has relied on in making her argument. We now proceed to a detailed demonstration of the evidence supporting our assertions. In Table 1 we extract data from the BU database that shows China’s global energy investments by CDB and China Eximbank over the 10 years from 2008 to 2017, showing total energy investments encompassing fossil fuels and clean sources; as well as investments in total power generation (where we know that clean energy sources water, wind and sun are 100% utilised in power generation). We also reproduce BU’s allocation of these investments to countries linked to the BRI programmes (numbering 62 countries, backlisted in the BU database even before the BRI was announced). In Table 2 we report these results in terms of proportions, focusing on clean energy investments as a proportion of total energy investments overall over the past 10 years, and more significantly as a proportion of total power generation investments. The fluctuating character of investments in WWS sources around the world for power generation is revealed, from 23% in 2008 and rising to a peak of 66% in 2013 and lows in 2009 (17%) and 2012 (24%), finishing at 55% in 2017. Overall investments in power generation from WWS sources outrank investments in thermal power generation over the past five years (53% of the total) and account for 44% of investments in total power generation over the past decade. That is why it is worth separating the performance globally of China’s power generation investments over the past five years from those over the past decade, to bring out the greater greening intensity of the more recent period. There is a clear trend over the past 10 years to higher and higher levels of investment globally in power generation from WWS sources, as shown in the chart that characterises the data in Table 2. We calculate the best line fitting these data, where the trend line is rising at an annual rate of 3.5% and is approaching 57% in the year 2017, ie to a point where Chinese green investments globally in power generation definitively exceed black investments (Figure 1). As a point of comparison, we also include the rising proportion of investment in domestic power generation facilities from WWS sources, where China is known to be a world leader. This red line can be seen to be rising continually over the past 10 years, from 41% in 2008 to 51% in 2017, or a 10% increase in investments in WWS sources as a proportion of investment in total power generation over a 10-year period. The result is that China’s investments in domestic power generation are utilising clean sources for more than half of the total domestic investment (according to data from the China Electricity Council), ie the clean and green investments outweigh the black. It is notable that the proportion of power generation investments domestically in WWS sources exceed 50% in each of the seven years from 2011 to 2017 (ie green sources outweigh black sources in each of these seven years). It is also the case that green investments domestically have outranked thermal power investments in power generation over both the last five years and over the past decade. There is no doubt about the reality of China’s green shift in electric power generation in the domestic arena. What we are demonstrating in this note, using data from the BU CGEF, is that there is a comparable green shift in China’s energy investments globally, if not to the same degree as is found in China itself. The green shift in terms of investment in power generation projects around the world by China is reinforced by the important initiative taken by the China Eximbank at the end of 2016 to issue its first green bond. This was a bond valued at RMB 1bn ($144m) and issued over a five-year term. It marked the first issue of a green bond by a policy bank in China; earlier green bonds had been issued in China by commercial banks as well as the People’s Bank of China. The funds raised from the bond markets by this issue will be directed towards the financing of green projects around the world. John A Mathews is Professor of Management, MGSM, Macquarie University, Australia, and formerly Eni Chair of Competitive Dynamics and Global Strategy at LUISS Guido Carli University in Rome. Xin Huang is a research assistant and financial analyst. This article originally appeared in The Asia-Pacific Journal and is republished here with permission.